After another embarrassing exit from the Stanley Cup playoffs, Minnesota Wild owner Craig Leipold fired his general manager, Chuck Fletcher. The firing was long overdue, as the Wild were stuck in the limbo between contender and rock-bottom. However, Fletcher did make plenty of solid moves (as well as terrible) for Minnesota through both trades and free agency. What do the Wild lose from what their former general manager brought to the table? The 2014-15 season for the Wild was not going as planned. The goalie situation was a disaster and the team was on the verge of a complete collapse due to its situation between the pipes. Fletcher made the best trade of his life in acquiring Devan Dubnyk from the Arizona Coyotes in exchange for a third-round draft pick. Dubnyk immediately became the full-time starter and went on to start in 38 consecutive games to help guide the Wild to the playoffs. After his heroic efforts, Dubnyk was rewarded with a six-year, $26-million contract. He has since made the All-Star Game twice, joining forward Marian Gaborik and defenseman Ryan Suter as the only players to make the All-Star Game two or more times in a Wild jersey. During the 2016-17 season, Dubnyk posted 40 wins, which stands as a single-season franchise record for the Wild, and he now currently ranks second all-time in wins with 134. 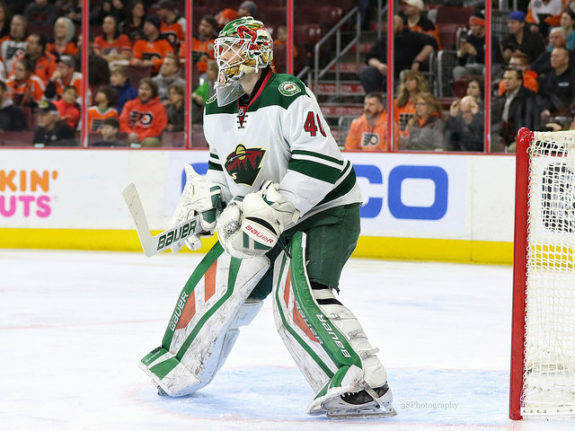 He has had a tremendous career with the Wild, and if Fletcher is remembered for anything positive in Minnesota, it’s bringing in a starting-caliber goaltender for scraps. The Wild have had a history with successful first-round draft picks under the leadership of Fletcher. Notably, the Wild have drafted Mikael Granlund, Jonas Brodin, and Matt Dumba, all of whom have enjoyed various levels of success at the NHL level. However, twice the Wild have traded away their first-round pick. In both 2013 and 2017, the Wild were held without a draft pick. Currently, Minnesota has zero Stanley Cups to show for its lack of first-round draft picks in each of those years. The 2016-17 season is still fresh in the mind of many Wild hockey fans. The team was enjoying its most successful season since joining the NHL as an expansion team. Minnesota posted a franchise-record 266 goals on the year, along with 49 wins and 106 points, also team records. 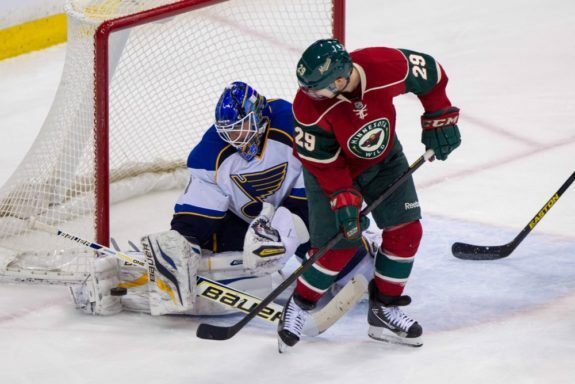 The Wild of course slipped in the first round and lost their playoff series to the St. Louis Blues, 4-1. That season, Fletcher felt the need for the team to add more scoring to make for a significant Stanley Cup push. He quickly made another deal with the Coyotes, this time with far less success. The team added Ryan White and Martin Hanzal along with a fourth-round pick in exchange for a 2017 first-round pick, a 2018 second-round pick, and a conditional draft pick in 2019. The results of the trade included little impact from the new players, the destruction of the team’s chemistry, and elimination from the Blues in the playoffs. The next general manager will have a fun time still suffering the consequences of his predecessor’s decisions. The final blockbuster trade for Fletcher probably went the way it should have given his track record. The Buffalo Sabres shipped Marcus Foligno, Tyler Ennis, and a third-round pick in exchange for Marco Scandella, Jason Pominville, and a fourth-round pick. The trade was made to create cap flexibility, but after re-signing Foligno and with Ennis’s existing contract, it didn’t clear much room. Pominville finished his season with 16 goals and 18 assists while Scandella managed five goals and 17 assists. Foligno added eight goals and 15 assists while Ennis had eight goals and 14 assists. There is a vast difference in plus/minus totals but because Buffalo is not a competitive team in the slightest, it’s not an important stat with which to compare the players. In conclusion, either player the Wild got rid of would have been more useful than what they got in return. 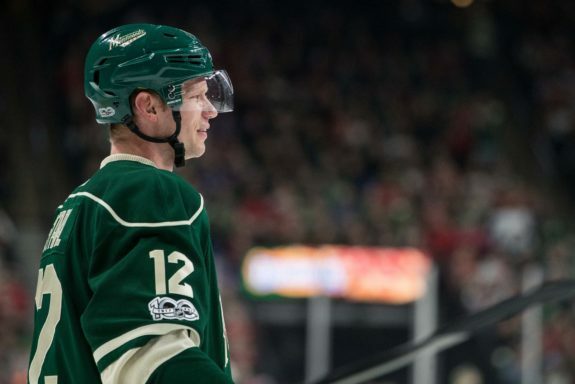 Everyone knows about the huge 13-year, $98-million contracts Fletcher handed out to free agents Suter and Zach Parise before the 2012-13 NHL season. While the Wild have gone on to make six straight trips to the postseason since their signings, the former free agents are not even halfway through their deals, are quickly aging, and have failed to help guide Minnesota past the second round of the playoffs. The two contracts have hampered the Wild and allowed for little wiggle room with the salary cap. 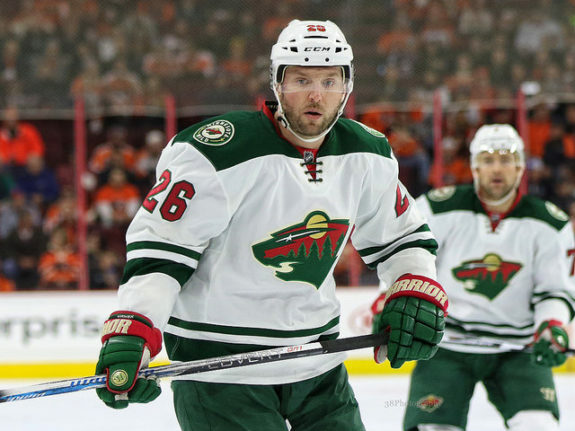 Thomas Vanek was handed a three-year, $19.5 million contract to provide a boost in scoring. Vanek played two seasons in Minnesota, appearing in 154 NHL games for the team. He registered 39 goals, 54 assists, 93 points, and a plus/minus of minus-15 during his tenure in Minnesota. His play resulted in Fletcher buying him out of the final year of his contract. Eric Staal was the last major free agent signing that Fletcher brought in. Fletcher sure worked his magic on this signing. Staal was signed to a three-year, $10.5 million contract. In Staal’s first two seasons in Minnesota, he has put up remarkable numbers, registering 70 goals, 71 assists, 141 points, and a plus/minus of plus-25. Not to mention Staal tied (with Gaborik) the single-season franchise record for goals with 42. He was also selected to the All-Star Game for the 2017-18 season. Elimination in the opening round should be a thing of the past for at least a season or two. That could mean the Wild enter a minor rebuild stage or push to the next level with the right leadership. With a new general manager, no player will be safe (unless his contract says otherwise), as there will be no strings attached with any player because they all came from the previous regime. That could spell trouble for the Wild’s upcoming free agents as well as the overpaid and under-producing players that plague the team’s roster. One of the reasons Fletcher is gone is his lack of postseason success. The next general manager will have to prove he can turn the course quickly if he doesn’t desire to meet the same fate.